Rate this project Jerry Bezencon has announced the release of Linux Lite 4.2, the latest build of the project's desktop-oriented distribution with Xfce, based on Ubuntu 18.04 LTS. This release sees an addition of Redshift, an application that adjusts the computer display's colour temperature based upon the time of day: "Linux Lite 4.2 final is now available for download and installation. This release has a number of minor changes. Think of it as 'refinement' and not a 'major upgrade'. There are some new wallpapers and some minor tweaks here and there. Redshift has been added to Lite Software. Redshift adjusts the color temperature according to the position of the sun. A different color temperature is set during night and daytime. During twilight and early morning, the color temperature transitions smoothly from night to daytime temperature to allow your eyes to slowly adapt. At night the color temperature should be set to match the lamps in your room. This is typically a low temperature at around 3000K - 4000K (default is 3700K). During the day, the color temperature should match the light from outside, typically around 5500K - 6500K (default is 5500K)." Read the rest of the release announcement for more information and screenshots. Download (MD5): linux-lite-4.2-64bit.iso (1,348MB, torrent, pkglist). Jerry Bezencon has announced the release of a new version of Linux Lite, an Ubuntu-based distribution featuring the Xfce desktop environment. Some key changes in version 4.0 include a new backup utility, replacing home directory encryption with full disk encryption and dropping 32-bit support. 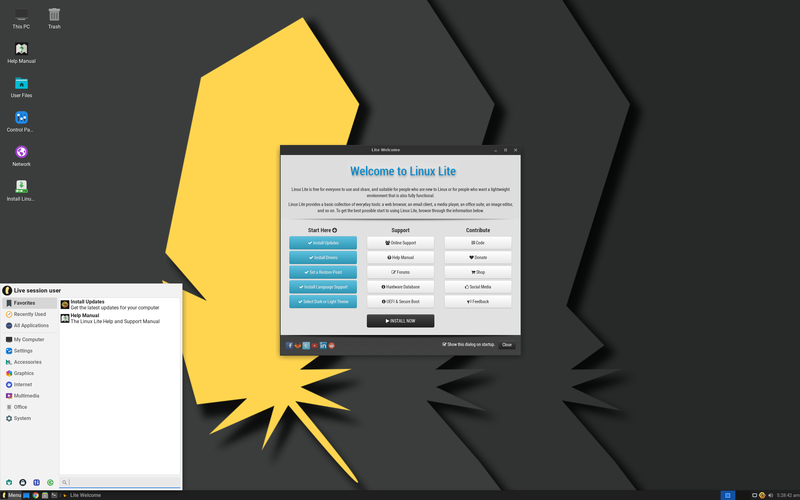 "The main changes in Linux Lite Series 4.x include a new icon and system theme, Timeshift for system backups, Shotwell to manage and perform basic edits on images, MenuLibre to manage menu entries, new Lite applications including Lite Desktop that manages common icons on the desktop, Lite Sounds to manage system wide sounds, and many of our existing applications have been updated. See below for all the changes: Minimum recommended specs have been raised slightly to more realistic levels (RAM, CPU). There are no more 32-bit ISO releases. If you still require a 32-bit OS due to hardware limitations, series 3.x is supported through to April 2021. Xfce PulseAudio plugin, has been added to the system tray for highly customizable options regarding volume management. Full disk encryption now replaces home encryption in the installer (an Ubuntu implementation)." Further details and screen shots can be found in the project's release announcement. Download (MD5): linux-lite-4.0-64bit.iso (1,349MB, torrent, pkglist).